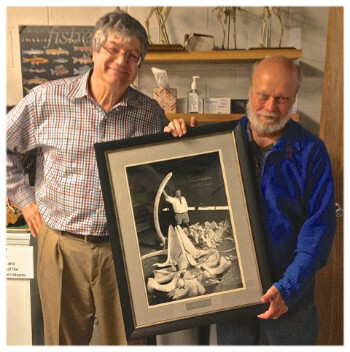 At a recent meeting of the Friends Board, Professor James W. Porter presented to the museum a reframed photograph of Dr. Joshua Laerm amidst a set of whale bones. Dr. Laerm was the first Director of the Georgia Museum of Natural History. He was responsible for the creation of our organization, Friends of the Museum, in 1999. Dr. Robert Wyatt reports that the Friends field trip to Black Rock Mountain, May 6-8, can accommodate one more female in currently reserved cottages. More cottages can be reserved perhaps, but we need to do it now. Day-trippers are welcome to join the wildflower walks, and perhaps stay overnight in nearby Clayton, Georgia. Please contact Dr. Wyatt (rewyatt@uga.edu) for information about the wildflower excursions. Several walks are planned, beginning Friday afternoon and ending Sunday by noon. Dust off those close-focusing binoculars and get ready for some butterfly spotting! And listen to Friends member Dr. James Porter’s presentation on "The Flap of a Butterfly’s Wing: The Extraordinary and Essential Butterflies and Moths of Athens-Clarke County," Thursday, March 3, 7 pm. at the Sandy Creek Nature Center. Dr. Porter's talk is co-sponsored by the Oconee River Audubon Club and the Friends of the Georgia Museum of Natural History. Dr. Porter is Meigs Professor of Ecology and Curator of Marine Invertebrates at the Museum of Natural History.